Videos (3): The hosts (Bowman and James King) step inside Dumbledore’s Office for the first time; Jessie Cave (Lavender Brown) gives a tour of the set and talks about working with Rupert Grint, Dan Radcliffe and Emma Watson; and King explores the Harry Potter prop store. Photos (18): See photos of the hosts exploring the set and getting their own makeup done. 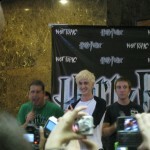 Also see photos of them with stars Cave, Grint, Jason Isaacs (Lucius Malfoy) and Tom Felton (Draco Malfoy). Audio (180 minutes): Bowman and King get a “sneak preview and all the backstage gossip from the stars” during this three-hour show from the set of Dumbledore’s Office. Harry Potter and the Deathly Hallows: Part I hits theaters on November 19, 2010, and Harry Potter and the Deathly Hallows: Part II, hits theaters on July 15, 2011. Potter fans rejoice! Harry Potter and the Half-Blood Prince hits theaters today, July 15. So, whether you attended one of the more than 3,000 midnight showings, or plan on seeing the film at a later date (in theaters, on DVD, or even on TV), we hope you enjoy it as much as we did! Thanks to MuggleNet and RupertGrint.net. 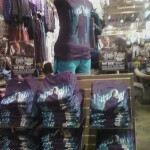 Harry Potter Fan Zone staffer Hannah was on the scene earlier this evening when Tom Felton was in New Jersey for a poster signing at Hot Topic, which was followed by a quick Q&A session outside of Urban Outfitters. You can see some pictures of both events below thanks to Hannah. Daniel Radcliffe appeared on the Late Show with David Letterman this evening, and you can now see a video of his appearance over at YouTube or below thanks to HarryPotterTrio.com. Remember that you can see pictures of Dan arriving at the studio to tape his segment by clicking here.